The Focused Crystal Laser is a Rift weapon and is part of the Riftwalker Set. By combining the altered high technology scavenged from the most powerful Burroughs Rift mice and the remains of a smashed Crystal Tower, Digby scientists have learned how to focus Rift Power into a terrible laser beam capable of bringing the fight to the Rift mice like never before! By focusing all the Crystal Laser technology into a single beam, the most power possible can be directed at a single target. This trap's high power combines exceptionally well with the Rift Power Charm's power bonus, and makes this trap fantastic for catching tougher boss Rift mice, though it suffers slightly against the remainder of the weaker, sneakier Rift mice. 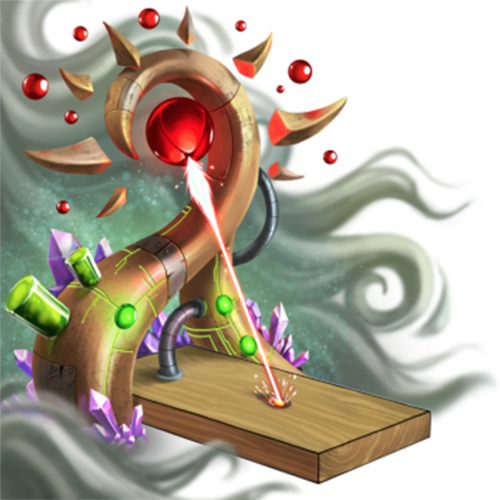 The Focused Crystal Laser can be purchased from the Burroughs Rift Trapsmith for 1,500,000 gold, 1 Shattered Rift Crystal (from smashing a Crystal Tower worth 4,900,000 gold), and 50 Rift Circuitry, but only if the hunter has obtained the Null Gauntlet (looted from The Menace of the Rift). It cannot be refunded. Crystal Tower – Source of Shattered Rift Crystal required for purchasing the Focused Crystal Laser. 9 September 2014: The Focused Crystal Laser was released with the introduction of the Burroughs Rift.